I am a widely published poet and a happy performer of my work. Although I have written in every genre except the novel – plays, books and features, I am primarily a poet with roots deeply planted in the theatre. I have written four full poetry collections and five pamphlet collections and performed UK wide, in the USA, Canada, France, Germany, Finland and India. My work has been broadcast on both Radio 3 and 4, read by me and by others, and has appeared in anthologies, magazines and journals worldwide. I am a trained performer and worked as an actress for some years alongside my writing career. I am Artistic Director of the Bakehouse a flourishing arts venue in South West Scotland, I run Locally Sourced a performanve venue in West Hampstead and performance and skills development workshops for writers and performers country wide. 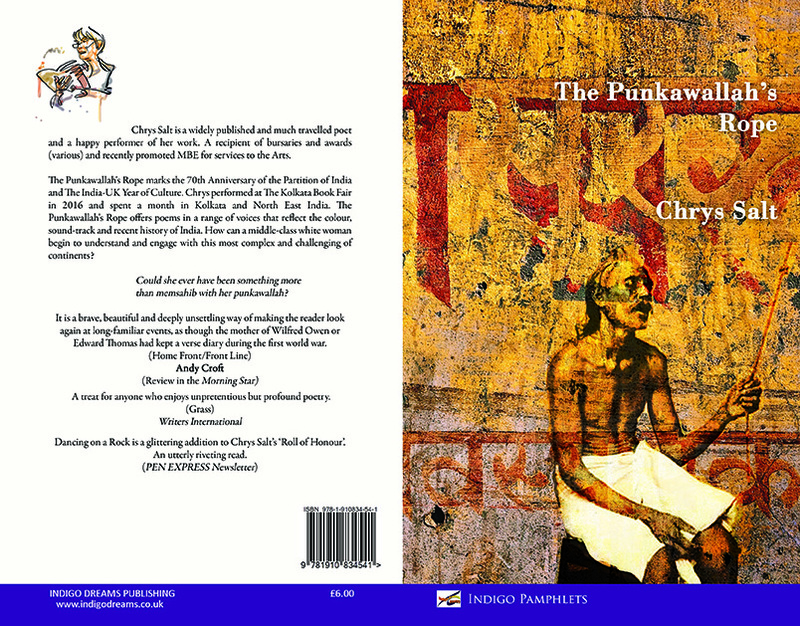 I am Literature Convener for BIG LIT: The Stewartry Book Festival in S W Scotland and on the Editorial Board of the online lit mag Gitajali and Beyond, based at Napier University. I have been a recipient of Bursaries and Awards ( various) – list below, was awarded an MBE for services to The Arts in Dumfries and Galloway in The Queen's Birthday Honours List 2014 and am listed in Who's Who. On this website you can see and hear samples of my work, buy my books and contact me about residencies, workshops or readings. FOR INFORMATION ABOUT FORTHCOMING READINGS AND FESTIVALS GO TO MY NEWS PAGE. 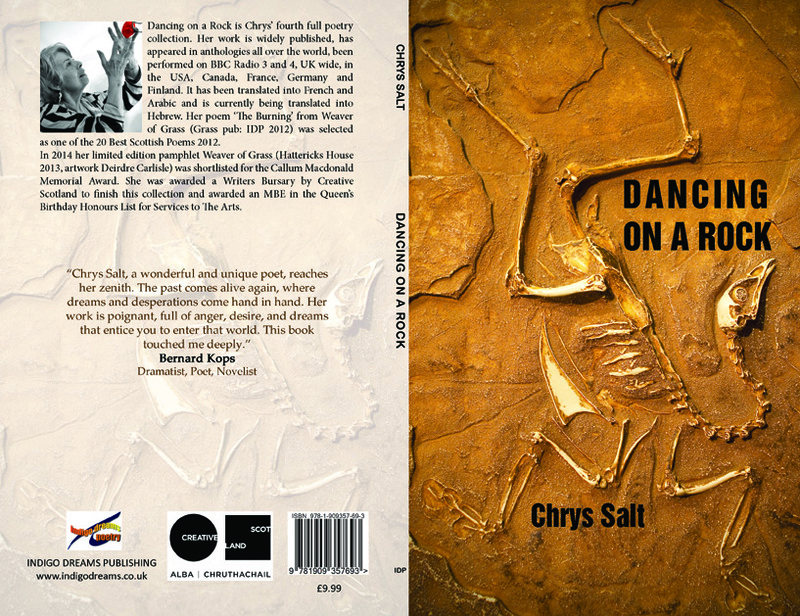 Awarded a Creative Scotland Writing Bursary 2014 to finish my penultimate collection Dancing on a Rock and another in 2017 to visit The Yukon to pursue research into The Klondike Gold Rush for the collection I am currently working on. 'Chrys Salt, a wonderful and unique poet, reaches her zenith. The past comes alive again, where dreams and desperations come hand in hand. Her work is poignant, full of anger, desire and dreams that entice you to enter that world. This book touched deeply. On the tenth anniversary of the 2003 invasion of Iraq, Home Front/ Front Line records a moving dialogue in poetry and prose between the poet and her son, who, as a Territorial Army Paratrooper with the 7th Royal Horse Artillery (PARA), was mobilised to Iraq in February 2003 and spent 5 months in action. Published by Award Winning Publisher Roncadora, it is a hand- made limited edition, its publication timed to coincide with the 10th Anniversary of the conflict. An interview with Iraqi TV December 2013 can be found on YouTube. 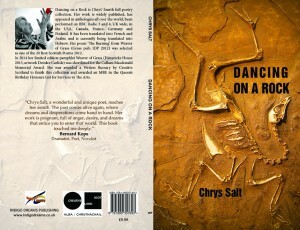 It would take a hard heart to ignore the appeals of Chrys Salt’s new book Home Front/ Front Line (Roncadora, £8). Published to mark the tenth anniversary of the 2003 invasion of Iraq, is an extraordinary and moving dialogue in poetry and prose between the poet and her son, a Territorial Army paratrooper who in 2003 spent five months in Iraq with the 7th Royal Horse Artillery. It is a brave, beautiful and deeply unsettling way of making the reader look again at long-familiar events, as though the mother of Wilfred Owen or Edward Thomas had kept a verse-diary during the First World War.